Detroit is equally horrifying and disappointing. Without question, Detroit’s portrayal of the despicable events at the Algiers Motel in 1967 is gut-wrenching and intense. In terms of pure, raw filmmaking, it is top of the line. But it’s also something of a missed opportunity. It focuses on the events of 50 years ago, offers up a wealth of material for discussion, but it doesn’t serve as a tool for healing. Detroit has an uncommon start. There’s an animated prelude (bringing motion to Jacob Lawrence’s Migration series of paintings from 1941) that sets the stage for the events to follow, explaining the societal shifts pre- and post-World War II, with populations and jobs moving around the country and from urban centers to suburbs. In the ebb and flow of the populace, portions of Detroit were left in the lurch. It’s an elegant way to establish some context. 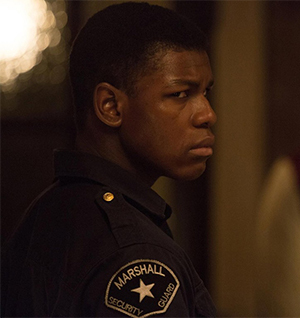 The trouble is, while the convergence of characters and events leads to a painfully detailed focus on the murder of three black men in the Algiers (based on — as the movie notes — conjecture and interviews with some of those involved), it covers the flames of the grotesque injustice while skirting around the kindling that fueled the fire. If all is historically accurate as depicted here, Officer Philip Krauss (Will Poulter, We’re the Millers) should never have been allowed back out on the streets if he was indeed going to be charged with murder — for shooting a black man in the back as he ran away with a bag of stolen groceries. It was known then that Krauss was blatantly racist and conducted himself in ways unbecoming of an officer. Clearly, theft is not a crime warranting that kind of force. Krauss was a bad cop. And yet he was put back on the streets, in the thick of the riots. Those riots (starting on July 23, 1967) were in response to escalating tensions between black citizens and white police officers, including the violent closure of an after-hours club. The activity led to the involvement of 1,100 national guardsmen and the arrest of 3,200 citizens. The riots turned a 50-block area of Detroit into a no-go zone, a veritable war zone on par with Vietnam. That’s all in the aftermath of riots in 1943, when America was embroiled in fighting Nazis abroad while migration, jobs and racism threatened to tear the country apart domestically. Ultimately, it’s a series of inappropriate actions and equally inappropriate reactions from both “sides.” But the real problem is the core notion of “sides” in a country that should be color blind and egalitarian. Providing an extra layer that attempts to address the complexities of an environment tainted by looting, vandalism and street violence — actions that largely betray the local population itself — would have helped provide a larger canvas that could more openly acknowledge the “good” and the “bad” on both of those “sides” of the racial divide. The narrative here moves from the broader riots to the Algiers Motel as a group of hopeful Motown musicians meet up with a couple (white) girls from Ohio and their new-found (black) friends, relationships formed in the calm, light-minded atmosphere of the motel’s pool area. The tragedy to follow stems from a ridiculously simple and misguided attempt at self-empowerment and defiance. One of the men in this rather random collection of people decides it’s a good idea to fire a starter pistol out the window of his hotel room. It’s a harmless gun, even at close range. But it’s a big spark in an already over-heated situation, one wherein civilian snipers have fired on police officers. As the police begin to interrogate the party-minded, mixed-race crowd, nobody confesses to firing a gun or even owning a gun. Krauss thinks it’s a good idea to play a “game” of pretending to kill an interrogation subject in order to spur on some honesty from the others. Or at least that’s his cover. During the course of the nightmare, three black men are killed. Action. Reaction. Escalation. Retaliation. Confusion. It’s hard for the blind eyes of justice to find peace in such an environment. 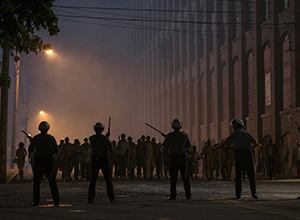 Detroit marks the third collaboration between director Kathryn Bigelow and writer Mark Boal, following Zero Dark Thirty and The Hurt Locker. As with the reference to Area 51 in Zero Dark Thirty, the duo make some questionable choices here that detract and distract. Granted, Melvin Dismukes was a real security guard and he really was there at the Algiers. But as portrayed by John Boyega (Star Wars: The Force Awakens), he seems like a guy going to great lengths – and taking on a substantial amount of personal risk — to insinuate himself into the situation, even as a sort of fly on the wall making peace offerings of coffee and contraband liquor. There’s something about this portrayal that doesn’t feel genuine. Maybe it is 100% accurate and authentic, but it nonetheless is a case of a character conspicuously drawing attention to himself. And there’s also the thread involving Larry Reed (Algee Smith, BET’s The New Edition Story). Larry has a stunning voice and a stirring stage presence; he wants to make it big in Motown. Detroit goes off on tangents with his musical aspirations, which are torn apart and ultimately shunned in the wake of the Algiers. There’s a complete movie in Larry’s story. Perhaps a more broadly effective one, to boot. Having survived the Algiers nightmare, Larry no longer wants to participate in Motown. He doesn’t want to entertain white people. He goes on to work in a church choir, completely abandoning his youthful ambitions. And that’s the crux of the problem. An act of racism leads to an act of — essentially — reverse racism. Racism, after all, crosses and moves within all colors. This is where Detroit could’ve found a voice for putting things into context for today, following up on the eloquence of the stage-setting context at the movie’s beginning. But, instead of being a call for healing and introspection, Detroit falls into the trap of following its narrative through an unbalanced trial (held in May 1969) which acquits the three officers accused of murder based on a lack of evidence and then into a series of “where are they now” updates that buries the story’s real lead: the far-reaching, decades-spanning impact of all those actions and reactions.